Amelia Bearheart to the world! 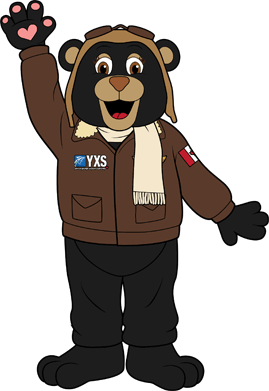 Amelia is a fun-loving pilot who loves her home town of Prince George. She can be found walking through the Prince George Airport terminal and high in the sky flying planes. Because she is so passionate about Prince George, Amelia can also be found meeting new people, attending popular events and giving back to her community. What does a perfect day in Prince George look like? “If I am working, the perfect day starts off with getting on board the aircraft and knowing a few people on my flight. As Prince George is such a friendly community, often times I know at least a couple people. Another highlight of my day is when I get to be part of someone’s first flight. There is something so magical about flying and I am so blessed I get paid to do this. Once I am done my shift, I enjoy hiking the back country and cooling off in one of the many lakes around Prince George. Print out Amelia Bearheart’s colouring book! Instructions: When you click the button to download, the colouring book PDF will open up in your browser. When it opens, look to the top right corner of the PDF and you will see icons in which you can choose to save the PDF to your computer, or to print it.